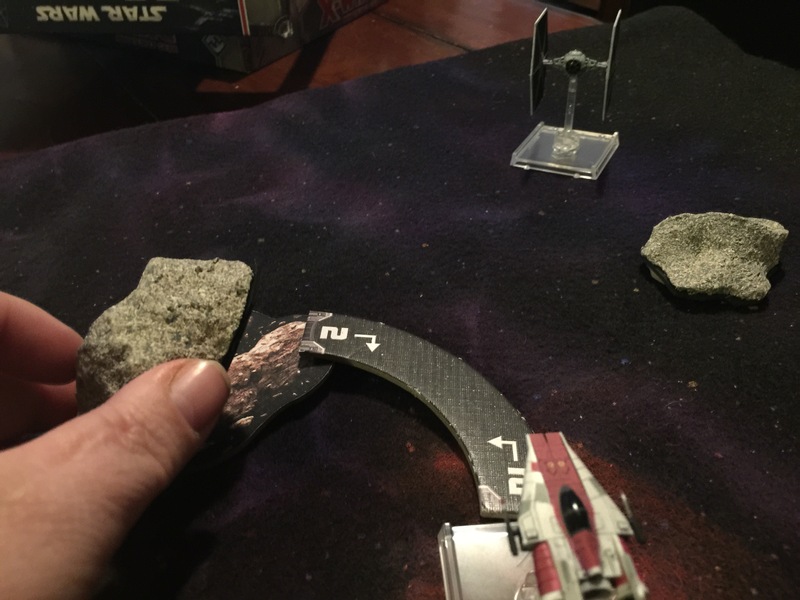 The other day a friend told me that they would really like some 3D asteroids for their Star Wars X-Wing game. The fact that the ships look so good and everything pops nicely on the board for them was a big draw in the game. But the simple flat tokens for asteroids were effective but did not “Feel” like big floating rocks in space. 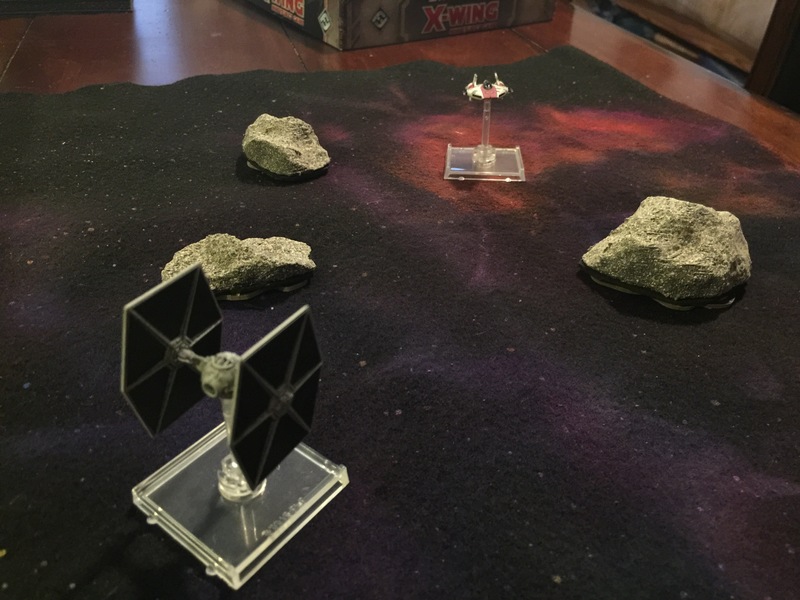 So I set to the task of crafting some asteroids, I have made a set that I like very much in the past but they have a few negative aspects that I will touch on later. I headed to the internet to see if anyone had done some of the hard work for me already and it turned out that they had. On thingverse I found two styles of asteroids and decided on the half rock asteroids over Rocks on stands. My reasoning was this. If I made them with flat bottoms and They could be simply set over the top of the existing tokens. Thus if an starship looks as if it were going to strike the 3D model. You can simply lift the rock up and out of the way to determine if it did indeed need to roll for collision. As well as have a marker on the board of where to return the asteroid once the model was out of the way. Without putting a token on the board I worried issues would arise as to proper placement in later rounds. I so I printed off a run of them and I was pleased to find them waiting for me several hours later. Once they cooled off I primed them and popped them off the rafts I printed them on. Touching them up with a bit of supper fine sandpaper and a layer of texture spray paint was the next step. 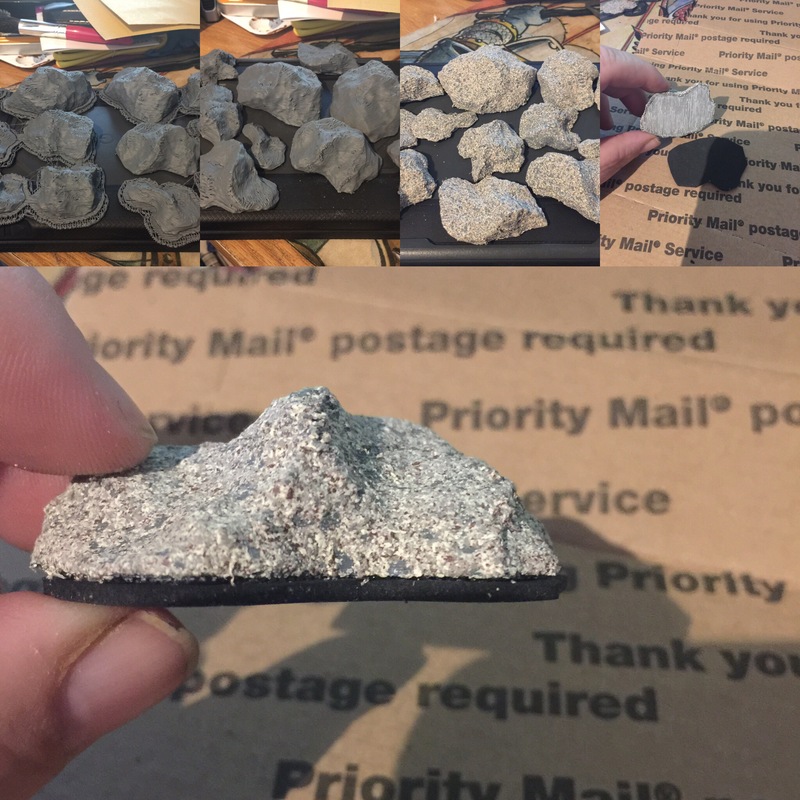 Once they dried I hit them with sealer and moved back to the craft table with my “Space Rocks”. I stenciled out some rubber bases while the amazing hot glue gun heated up. After a few snips and cuts it was ready to go. A nice layer of Glue and some pressure till they dried and I was very satisfied with the end result. I took them to show them off at the game store the next day and my fellow players were supper pleased with the result! What do you guys think ? Would you use these at the table? Now in the past I had made another set with stands and Lava Rocks. They look is great on the table. BUT, yeah we have a but. The rocks were ugly in transport and tended to be top heavy. Also they did not cover the stands of the tokens they stood on top of them. Overall I prefer this look. How about you guys ? Now I know that there are a ton of other ways these could have been made, Everything from using paper Mache or insulation foam. But for me I just love having an excuse to crank something out with the printer. Previous postIntroducing the Crafting Corner!